Our last day in Mumbai was a relaxed one with members of the touring party variously using the hotel’s outdoor pool, taking in some of the city sights and visiting the market stalls on the Colaba Causeway to buy presents and souvenirs. Brian and I had already done our quota of shopping and we had been recommended to go to Leopold’s Cafe for coffee and cake. 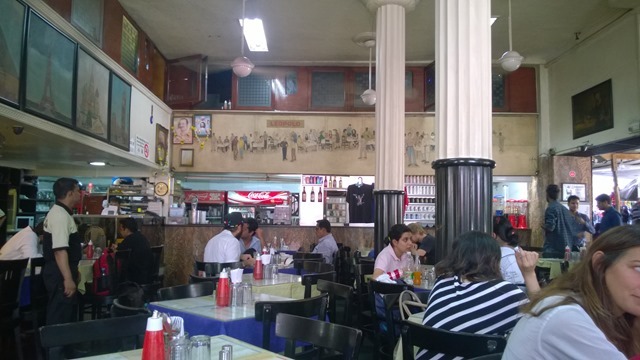 It had a very 1950s feel to it but bullet holes in the wall and mirror belied the cafe’s claim to infamy. For this was one of the places that terrorists chose to launch their shocking attacks on Mumbai in 2008. The Taj Mahal Palace Hotel across the road was another venue to be bombed as was the Trident Nariman Point Hotel where we were staying. It is worth looking up on the internet the tragic events that unfolded but briefly a Pakistan based group set off bombs and fired bullets at a number of locations around the city, killing 164 people and injuring hundreds more. 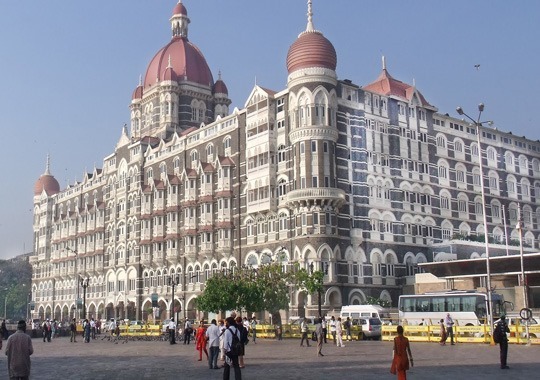 A siege took place at the Taj Mahal Palace until after three days special troops stormed the building killing all but one of the terrorists. This and other terrorist attacks means that there is always a state of high alert at key points across Mumbai with bag and car searches a regular occurrence, reminiscent of London in the 1970s during the IRA’s bombing campaign. The tragedy is mentioned frequently by locals to tourists asking if they would like to see the Taj Palace and the damage in Leopold’s. Packing done we got into the coach to leave for the airport but with a planned detour for a cup of tea and a sandwich at the residence of one of the Bombay Gymkhana players who lived in a very exclusive suburb of Mumbai. Rather than the promised ‘ten minutes from the expressway’ it took us 45 minutes to find the apartment block so it was a case of all 30 of us marching into the living room, being introduced to the family, downing a drink and a piece of cake, a word of thanks from our leaders, then having stayed just half an hour we marched out again stopping for a group photograph in the garden. Fortunately we arrived in good time for our evening flight to Delhi, and I left Mumbai with memories of a bustling city with a strong colonial heritage tinged with recent tragedy, but where the people were welcoming, friendly and proud of where they live whatever their circumstances.